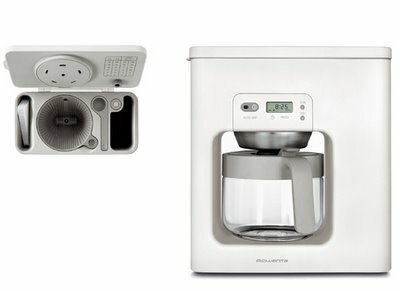 This modern organic looking coffee maker designed by Jasper Morrison for Rowenta is the best new coffee maker to hit the market in recent years. The white casing almost looks like a flight recorder. Made of polypropylene and stainless steel. It features a 10-cup brushed stainless steel carafe, and the machine itself has filters, spoons and a measure hidden inside. Jasper Morrison - best known for his furniture - told us that this design was three years in the making - but definitely worth the wait! Jasper Morrison Jasper Morrison has a well-established international reputation as a designer. From early success with door furniture to a recent major commission to design a tram, Morrison's ability to extend skill and composure of form across a broad range of products and materials confirms his success. Born in London in 1959, Morrison graduated in Design at Kingston Polytechnic Design School in 1982, then went on to study at the Royal College of Art in London and HdK, Berlin. The Side Table and Slatted Stool produced by SCP were the first designs of Morrison's to be manufactured. These were launched at Milan in 1986 and are still available from SCP. In the same year Morrison established his London design studio, from where he has successfully worked for a huge range of clients designing furniture, lighting and diverse products; Vitra and Cappellini being among the first collaborators. In the early days, his simple but striking designs for FSB, a German door handle manufacturer, won many industry design awards. As his portfolio matured, Morrison's approach attracted high level clients seeking purity in design solution, including Artifort, Alessi, Flos, Rosenthal, Magis and Sony. In 1995 Morrison's office was selected to design the new Hanover Tram for Expo 2000, the largest European light rail in production. The end result of this 500 Million DM contract, unveiled to the public in 1997, was the first vehicle to be awarded the IF Transportation Design Prize and the Ecology Award. Solo exhibitions and collaborations on several international exhibitions underline Morrison's status as a leading designer. His designs are in the permanent collections of several museums throughout the world, including the Museum of Modern Art, New York and the Victoria & Albert Museum, London.